When I was little, I rode a bus to school every day. In the holidays, I took a train to go visit our Grandma. I occasionally got a ride in a taxi car. And never ever got to fly in an aeroplane till I was an adult. My son gets to ride in a car every day. He has already been on a couple of long-haul and a short-haul flight. He has ridden on trams and steam trains a few times. But he has been on a bus just once in his two little years. J doesn't even have a proper bus amongst his array of toys. 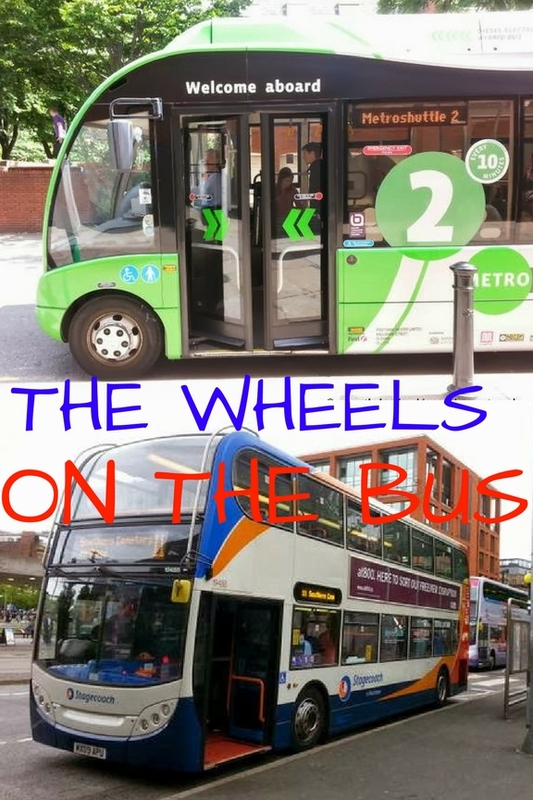 He has however, been singing about buses and their wheels going round and round every day since he was six months old. Or rather, been hearing me sing about buses and their wheels, wipers, bells, engines, since he was six months old! For reasons I can't even begin to understand, the child is absolutely fascinated by buses. He has to acknowledge the existence of every bus he sees by loud cheers and excited screams of, "Bussh, bussh, buuussh!" These continue till I endorse his enthusiasm with a rather more sedate, "Ho (yes), bus." They start all over again the moment he spots another bus. And believe me, they are not that difficult to spot given his wonderful vantage point in the back of my car! To put an end to the relentless squeals of, "Bussh," we decided to have a day out on the buses. So instead of taking the car or the rather more convenient and infinitely more sensible option of taking the tram, we took the bus into Manchester over this weekend. J was visibly excited. The only reason he went to bed on Friday was because he was to go on the bus the next morning. Come Saturday morning, he was on the phone to his Aaji (Grandma), telling her of his upcoming bus adventure. Not so many words, really just going "Bussh, bussh," down the phone. The child was so into the spirit of things, he even walked all the way to the bus-stop without so much as a whimper. Now admiring buses from a distance is a completely different ball game to actually waiting for the right one to turn up. As J found out, much to his consternation. We reached the bus-stop with a good 10 minutes to spare. Just in case the bus turned up early. True to form, it arrived 5 minutes late, which is not altogether too bad. But 15 minutes is far too long in toddler time. And waiting around, just waiting, is a completely alien concept in toddler land. It did not help matters that two other buses came and went, and we were still standing waiting for ours to show up! The actual journey into Manchester wasn't too bad at all. We were on the front seats on the top deck of a double decker bus. So J had an absolutely fabulous view of the entire route and was happy to sit and look around. He was very disappointed when we had to disembark at Piccadilly Gardens, and voiced his displeasure in no uncertain terms. Luckily for us, there is a wonderful network of free shuttle buses that runs through Manchester. So all we did was get off one bus and hop straight onto another one, and then another one. We did manage to get off the buses occasionally. A couple of times, once to get some lunch, and another time to visit the MSI (Museum of Science and Industry - more on that later). After a rather exciting day travelling all over Manchester by bus, we took the bus back home. Not before buying a little toy bus for J as a souvenir of his adventure. And not before J had added a new word to his ever-expanding vocabulary - "Bussh-shtock." That's bus-stop for the uninitiated.